Everybody loves the magic of magnets, especially when they are miraculously embedded in a beechwood trivet. But when this Staub Round Magnetic Trivet arrives at the table, there is no need to revert to primate behavior and start throwing stuff: it’s just one of man’s own creations. 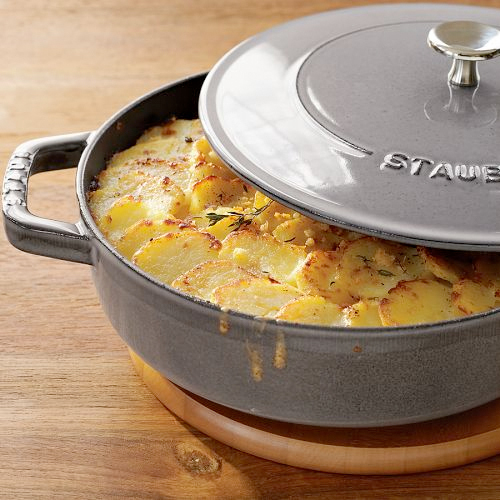 Available in two diameters, 6.5-inches and 9-inches, the handy trivets stick to cast iron and–don’t be surprised–other magnetic cookware, allowing for hot pots and pans to be used directly at the table. So everyone can set down for dinner and have a peaceful meal with no worries of leaving any marks. Unless your name is Tila Tequila.